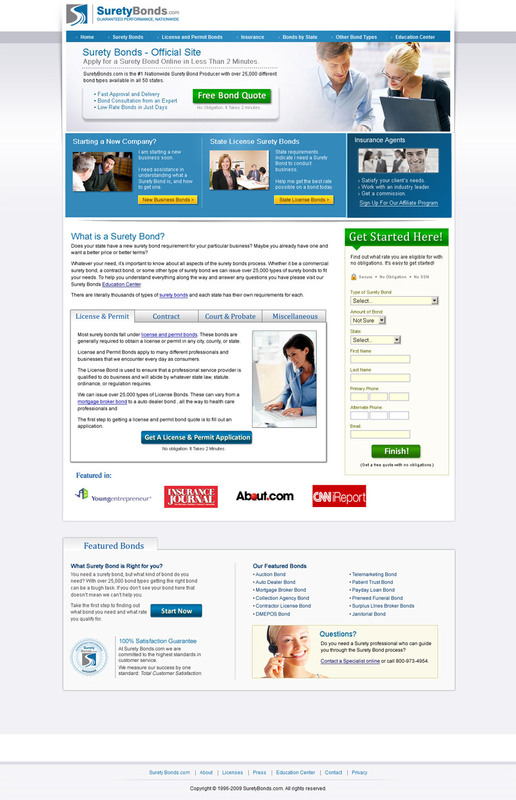 Today’s guest post is a conversion optimization case study by Kevin Kaiser from Surety Bonds. In my last post I referenced their lead capture form as a good example of how to keep your CTA above the fold on a lead gen landing page. Kevin discusses how he optimized a primary conversion goal – to have more customers complete a lead capture form to receive a quote. Many people approach their web marketing strategy mainly as getting people to their site. They take for granted that once a visitor gets there, the visitor will do exactly what they want them to do. Unfortunately, this is rarely the case. A complete web marketer realizes that you need to tell people what to do when they get to your site. The rest of this post will explain some of the things I performed on SuretyBonds.com to help increase conversions by 27%. The site performs well drawing in visitors. But we couldn’t get them to fill out the form at a rate we thought was appropriate and decided to make and test some changes. For each of our tests, we ran an A/B split test for 2-3 weeks until we were able to gather a statistically significant amount of traffic. We had decided to work with A/B testing as it is simpler that Multivariate and went with a 50% split of traffic to each page. Location, Location, Location: Where to put the form? When people are searching for a product, they have an idea in mind of what they are looking for. It is up to you to make sure they can find it as fast as possible. This is the basis of our first change. When someone reached our site, it was incredibly hard for them to find the form to fill out to receive a quote. Internally, we had no problem locating the form due to our familiarity with the site, but after watching a test participant struggle to perform this task it was clear that we needed to place the form in a more prominent location on the site. 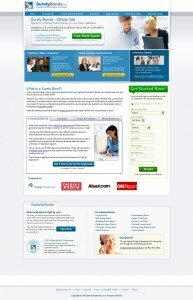 Note the form placement on the right-hand side of the homepage. Initially, we only had a link to the form in the side column on our homepage which did nothing to stand out from with the other links on the page. So the first step was to change the link to a more prominent button with a stronger call-to-action. This gave us a conversion improvement of 10% – a promising start. Something that conversion optimization practitioners suggest to do is to keep testing. So I decided to take things a step further and introduce a short form on the homepage. Using the same A/B testing, I was able to find that this version worked even better. And, being a devout tester, I decided to try another layout that included both the call-to-action button and the short form on the same page. This is the best layout I’ve found so far (and the one we’re currently using) and goes to show that testing different layouts (not even worrying about the content) can greatly affect conversion rate. Another discovery I made in my quest for increasing conversions was what kind of information is really needed to qualify it as a good lead. Obviously you don’t want to waste all your time by having your lead form bring in poor quality leads, but do you have to ask every single question available online to qualify it as good? A big thing with surety bonds is credit score, but I decided that we really didn’t need to ask people for their credit score online. This is one example of how you can work this into your own plan. Another thing I found is that just asking a question in a different way can increase leads. Surety bonds vary by state, so we were asking for their business address. By changing this and just asking for the state though, people seemed more apt to fill out the form. We’re able to get the rest of the info. we need when we call them back on the follow-up. These are just a few examples of things that we changed in our form that could give you some ideas of what you could try changing on your site. Running through this series of A/B tests helped increase the lead generation from our website by 27% compared to the original version. However, it didn’t end there. I had noticed that although we were pulling in more leads, we weren’t closing them at an increasing rate. The final step was to see how we could capitalize on these extra leads. With all these leads coming in, I wanted to test and see how smoothly our whole lead process was working. So I filled out our form and waited to get a call back about it. And waited, and waited. I think the first time I tried this I didn’t get a call back until around 4pm, about 7 hours after I filled out the form. Way to long for me to wait for a follow-up and apparently it was too long for the people filling out the form online. So, teaming up with our underwriting team, I had them call back as soon as we possibly could. Noticing that our volume started increasing, I decided that we should get someone to call back almost immediately after they filled out the form online and now our offline conversion rate was almost as high as our online conversion rate. The only difference between this technique and the two above is that it takes place offline, which something people leave out of the picture when thinking about conversion rate optimization. While there was no real tool I used to track this, the before and after comparison was great enough that we continue to do this today. The biggest advice I would give fellow marketers is to never stop testing. We are continually tweaking our layout and copy to get as high of a conversion rate as we can possibly achieve. If you’re a busy person and think you don’t have the time for this, think about hiring a consultant to improve your conversion rate. And remember, conversion rates don’t just jump immediately to high levels. It often takes place over a period of time with lots of little changes and maybe a few big changes as well. Often the return will be much greater than the investment, so figure out if it’s worth it in your industry/niche to outsource and start improving your conversion rate today. Kevin is the online marketing director for SuretyBonds.com, managing search engine optimization and conversion optimization. He has also been involved in other online marketing campaigns with other companies that have been named Inc. 500 companies including Plus1 Marketing (2009) and Mortgage Research Center (2007). When not at the office, he enjoys trying new foods, traveling, and running cross country.